De Blasio’s ferry plan for New York: It’s a bad idea. Ferries almost always are. They’re antiquated, inefficient, and mostly benefit the well-off. Why do mayors love them? 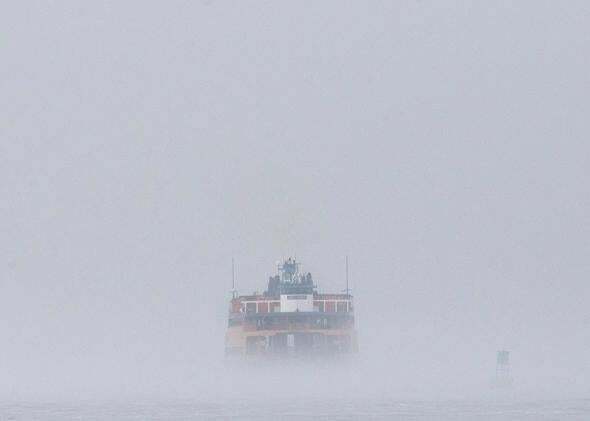 The Staten Island Ferry emerges from the fog in New York Harbor in November 2014. New York City Mayor Bill de Blasio was not a transportation candidate, and he hasn’t been a transportation mayor. He’s made no progress to “address outer borough subway needs,” as he promised in 2013’s contentious Democratic primary, and he won’t realize his vision of a “world-class” bus rapid-transit system by investing, as he has, in New York’s watered-down substitute, Select Bus Service. So what mode of transportation excites the mayor? Ferries. “We’re the ultimate coastal city. But somehow we haven’t had a true ferry system in decades,” de Blasio said in his State of the City address. Instead of asking why that might be, he revealed, to strong applause, his plan to initiate citywide ferry service by 2017—to bring, in other words, New York’s most popular form of transit of the 19th century to the 21st. The plan calls for six new, privately run, publicly subsidized ferry routes connecting 22 stops in the five boroughs. While a number of popular commuter ferries operate between New Jersey and New York, the intracity system is currently limited to the Staten Island Ferry (which began operations in 1817) and the East River Ferry, launched by Mayor Michael Bloomberg in 2011. Among city leaders, de Blasio isn’t alone in his ferry fetish. Like a drunk stumbling through the same old joke (and forgetting the punch line), the New York politician returns to ferries every few years. The city has been “considering” expanded ferry service since at least the 1980s; as early as 1991, the New York Times declared ferries “the newest fashion in urban transportation.” Yet, with the notable exception of the Staten Island Ferry, the mode remains irrelevant for most New Yorkers. It’s not just New York. Politicians from Tampa Bay to San Francisco Bay love ferries: They’re easy to launch and pleasant to ride. But their mobility value—their ability to get people quickly and efficiently from place to place—is limited. As a lover of public transit, I sometimes feel camaraderie obliges me not to criticize such endeavors. Like a fan of a perennially losing baseball team, I get excited about even the mediocre additions to our roster. But in New York, ferries don’t constitute a sensible transportation plan. Transportation may not even be their primary purpose. The principal problem with the proposed ferry network is its tiny projected ridership. Boats from Brooklyn to Manhattan may have saved the Continental Army in 1776, but they won’t do much to get New Yorkers to work. The city estimates that once it’s operational, the heavily subsidized, six-route network will carry 12,500 passengers a day, or about as many people as six rush-hour subway trains. Part of the issue is geographic: Employment density (and to a lesser extent, population density) in New York is low along the city’s 500-plus miles of coastline. The days when the piers teemed with stevedores are long gone, and even densely populated waterfront areas like the Lower East Side are cut off from the water by highways and parks. As a result, Bloomberg’s East River Ferry, which travels between Manhattan, Brooklyn, and Queens, is highly dependent on both recreational traffic and weather: Ridership in winter, assuming the ferries aren’t stuck in the ice as they were last week, is about one-quarter what it is in August. Ferries are a lot more fun than they are useful. All public transit is subsidized, of course. But what makes this a particularly inappropriate use of city transportation dollars is the clientele. Aside from the aforementioned Rockaways stop and a politically expedient stop at Soundview in the Bronx, the ferries will serve expensive or gentrified areas. A much greater obstacle than the price of the ticket is the cost of admission to now-pricey waterfront neighborhoods like Williamsburg. The best reason to spend $30 million a year running boats, however, isn’t to get people from place to place, but to encourage new construction. According to a 2013 report by the New York City Economic Development Corporation, whose suggested routes are closely aligned with de Blasio’s plan, residential development near the existing East River Ferry stops was up by 5 percent over three years versus comparable locations. Property values rose by 8 percent around stations. The total increase in property values around ferry stops was pegged at $500 million. In this respect, the ferry has much in common with another currently trendy and much maligned 19th-century transportation mode: the mixed-traffic streetcar, which is currently animating civic controversies in Atlanta, Washington, Cincinnati, and other places. Both are antiquated technologies, eliminated by cities and later revived. Both are considered “attractive” transportation options, if not necessarily efficient ones. (All things equal, those with annual incomes of more than $100,000, the NYC EDC report notes, are most likely to use the ferry.) And both the streetcar and the ferry have demonstrated a relationship with economic development that, though it sometimes muddles causation and correlation, has proven irresistible to elected officials. Fortunately, the ferry’s status as a creative-class amenity means it could pay for itself. The NYC EDC has recommended a handful of tactics to accomplish this, the most simple of which is: Make waterfront developers pay for docks in exchange for permits and zoning changes. Unfortunately, it’s worked the opposite way in practice. In November, for example, the city agreed to fork over $5 million for a ferry dock for the Astoria Cove development. Trading ferry service for waterfront construction isn’t necessarily a bad thing. But it’s not a transportation policy. And ferry-centric development comes with another risk. The very factor that makes ferry service an attractive short-term goal for politicians—the low ratio of fixed costs to operating costs—also makes routes vulnerable to budget cuts. That’s what happened in New Orleans, where the historic Algiers Point ferry was imperiled when the state legislature shifted its funding, derived from nearby bridge tolls, toward other uses. Shortened schedules and pedestrian fares followed; ridership fell by 55 percent in 2014. New Yorkers scouting ferry-accessible apartments ought to take that as a warning sign: Out of some 70 routes tried here since the 1980s, fewer than two dozen endure, mostly crossing the Hudson to New Jersey. Aficionados like to point to Hong Kong as evidence that New York can develop an effective waterborne transit system. Indeed, Hong Kong boasts the largest urban ferry system in the world. In December, its various companies clocked an average of 138,000 daily boardings. From City Hall, that must look like enviable success. Actually, Hong Kong’s is a system in decline. As recently as 1979, Hong Kong ferries were registering 576,000 daily boardings. By 1989, that number was down to 320,000. In the 25 years since, the city has added 1.5 million residents, but ferry traffic has fallen by more than 55 percent. What happened? The city built tunnels across Victoria Harbor. The Cross Harbor Tunnel opened in 1972, followed by four more in the intervening years: one for vehicles, two for rail, and one for both. The allure of the wind in your hair was no match for speed and convenience. That New York’s overcrowded subways are considered cause for more ferries is ironic. After all, it was frustration with ice-stranded ferries, during the winter of 1866 to 1867, that led Brooklyn leaders to push for a fixed-route connection to Manhattan. The Brooklyn Bridge opened in 1883; the first trolleys crossed it in 1898. Subways arrived the following decade. Soon enough, no one was taking ferries at all. In both Hong Kong and New York, demand for ferries was an indicator of a deeply insufficient transportation system, not a solution. That’s true today, too.